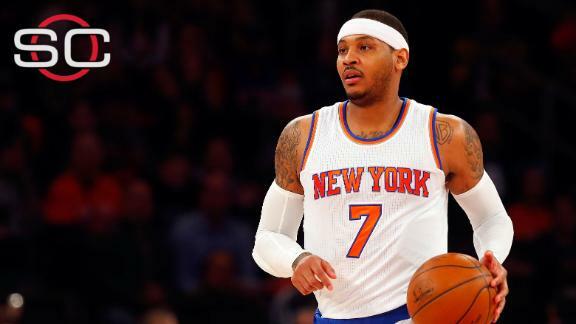 With the NBA trade deadline five days away, Carmelo Anthony reiterated that he has no plans to exercise his no-trade clause and leave the New York Knicks. "There's always some trade s--- going [on]," Anthony said Saturday during an interview on Sirius XM NBA Radio. "I'm not going anywhere." Anthony has a no-trade clause and repeatedly has said that he has no plans to waive that clause before the Feb. 18 deadline. The New York Daily News reported Friday that the Boston Celtics and Cleveland Cavaliers discussed a trade centered onKevin Love and that those talks involved "very preliminary" discussions with the Knicks about including Anthony in the deal. The Daily News reported that those talks did not progress. Anthony chalked up the most recent rumors as part of playing in New York, the biggest media market in the NBA. "When you're in New York, you're always up for grabs, I'll tell you that. Trades are always up for grabs," Anthony said with a laugh. "It's always, 'Who's next?' There's nothing guaranteed when you're in New York. But I don't pay attention to those rumors." Anthony, 31, has said several times in recent days that he is committed to staying in New York. He reiterated on Saturday that his goal is to play on a team that can contend for an NBA title. "I want to win a championship. At this point in my career, that's the only thing that I really care about," he said. "But I'm not, I mean, there's nothing out there for me right now. ... I'm not even entertaining no trade talk right now." Speaking on Saturday afternoon after practice with the Eastern Conference All-Star team, Anthony cited his decision to re-sign with the Knicks in free agency two summers ago as proof of his allegiance to the franchise. "Doing it in New York is better than doing it any place in the world," said Anthony, who noted that he has had no conversations with management about a trade. "One in New York is better than multiple somewhere else, so that was the reason I wanted to come to New York. That's the reason why I'm in New York, so it just bothers me when I started hearing all these trade rumors and trade talks." He added: "I don't know where [trade rumors] comes from so sometimes it gets to you as a player. Just get tired of hearing something all the time. I'm not on the run. I could've ran somewhere when I was a free agent, you know what I'm saying? I came back for a reason. I came back because I wanted to do this." The Knicks (23-32) have lost 10 of 11 games heading into the All-Star break and appear headed to their third straight nonplayoff season. Anthony raised eyebrows Friday when he hinted that he might reassess his situation with the Knicks after the season while speaking with reporters in Toronto. "That doesn't sit well with me -- kind of even to reflect a little bit on that and to think about that is tough," Anthony said when asked about missing the playoffs. "That doesn't sit well with me -- to know that it can be three years if we don't pick it up right now." Anthony was then asked whether he's thought about spending his future playing for a losing organization. "Not yet. I'm pretty sure I'll have that conversation with myself and my family and my team," he told reporters in Toronto. "But it's not a conversation for right now." Anthony also said that he'd like to share the floor in New York with another star player, which is understandable. New York is unlikely to land a star in a trade this season but is expected to have at least $19 million in salary cap space to spend in free agency this summer. "I think everybody kind of dreams and hopes that they can play with another great player, another star player. It's a star player's league," Anthony said. "I think that's what we talk about when we all get together -- 'I want to play with you, I want to play with you.' Even here, different guys say, 'Come play with me, come play with me.' So that's always the mindset. Sometimes it happens, sometimes it don't. "But I think everybody that's in my situation, that's in my position, they all want the load off especially the older they get. Because you realize you just can't do it all by yourself. Everybody knows that." Anthony also heaped praise on Knicks rookie Kristaps Porzingis, who has emerged as one of the top young players in the NBA. "[Porzingis] brought a new energy I think that we were looking for as a city, as a team, as an organization, and I believe that he will be here for a very long time," Anthony said. "He's 7-3, can shoot, can dribble, speaks multiple languages, loves music. So I'm a big fan of that. And just the way he plays the game -- I don't really think he understands how good he is, and how much better he's going to get." Stephen A. Smith comments on the rumors Carmelo Anthony could join LeBron James in Cleveland by the NBA trade deadline.